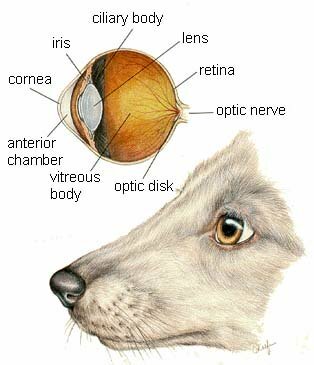 A Canine eye is a delicate and sensitive organ. Vision occurs when list is reflected off an object, which then enters into the eye. Light is the vital factor for eye functioning, with the intensity of light controlled by various eye structures such as the eyelids, eye medium, pupil, cornea and lens, before it reaches up to the retina. Once the light reaches the retina, a visual image is generated through specialized cells in the retina called photoreceptor cells. These photoreceptor cells number in the thousands, with each photoreceptor attached to a nerve fiber. Nerve fibers, collectively form an optic nerve which transmits these sharp visual images to the brain for identification and memorization. For this reason, light plays a vital role in eye function. The picture in this section are reprinted with permission by the copyright owner, Hill's Pet Nutrition, from the Atlas of Veterinary Clinical Anatomy. These illustrations should not be downloaded, printed or copied except for personal, non-commercial use. Almost all the vital functioning parts of a canine eye are dependent upon light entering into the eye, therefore a dog with a number of eye problems may experience problems to light. Different minor and major conditions, such as trauma, inflammations, infections, infestations, dog eye tumors, eyelids and even minor allergies can badly affect eye function, leaving a patient sensitive towards the light. That is why, avoiding light, irritation and severe classical signs in bright environments appear to be major clinical concern in dog eye patients. Immune mediated reactions or allergies, conjunctivitis, blepharitis (eyelid inflammation), chorioretinitis and dog eye worm infestations are some of the contagious conditions, which may leave a dog sensitive towards light. Similarly, dogs with congenital or traumatic anatomical deformities and abnormalities of the eyelids, eye orbital and eye socket may experience problems to light due to the inability to control the amount of light entering into eyes. Some breeds with large and protruded eyeballs may also go through problems towards light in middle to older age. In some other conditions, such as corneal ulcers, glaucoma, detachments, optic nerve problems and tumors, light entering into the eye may stimulate a nervous response, thus causing excessive pressure on various eye parts, leaving a patient with more severe symptoms. In such cases pain, eye discharges, discomfort and inflammatory responses are more intense than usual. Any canine eye problems to light is usually characterized by classical symptoms such as eye discharges, redness, inflammation, swelling, pain/irritation and discomfort. Intensity of these clinical symptoms is dependent upon different factors such as the cause of the dog eye problem, severity of etiology (cause of disease), chronicity (one or both eyes), breed and exposure to environmental factors including light. Light plays an important role in the vulnerability of the affected eyes. Clinical symptoms in an affected eye are not only related to eye function, but also to the eye as it forces itself to function. This effect of light on the affected eye parts thus causes a more intense inflammatory response (excessive inflammatory cell proliferation), leaving an eye with partial to complete loss of function. The underlying cause of any canine eye problem should be carefully diagnosed and treated specifically. Only a veterinarian should attend to and treat serious canine eye problems, such as infections, traumas, anomalies, tumors etc. Minor issues such as allergies and sub clinical infections can be treated by an owner at home with over the counter remedies, but it is always recommended that a veterinarian should be consulted prior to the administration of any dog eye remedy. Along with specific treatment, supportive care and management is required. A dog with a canine eye problem should get its eyes cleaned regularly and should be kept in a dark environment. Patients with anatomical deformities, traumas, that have undergone surgery, glaucoma, ulcers, tumors and retinal problems should specially kept in a dark environment to avoid problems to light. Natural remedies, such as dog eye cleaners and herbal eye health preparations can be administered as supportive components, to improve the healing process but also to enhance overall eye health and the immunity of the eye towards pathogenic and environmental factors. Preferred products include i-Clenz which is for safely cleaning areas around the eye and Eye Heal, which helps to improve eye health and immunity.